Live Creating Yourself. : Who Wears Short Shorts? Shorts season is upon us, ladies! Cannot wait to sport the 3" Chinos in sea mist that I just picked up from J.Crew's warehouse sale, currently available for $34.50 (usually $45). I also grabbed the slightly fancier Carson short in black; paired with some bright colored heels, they're perfect for a summer night out on the town with my girlfriends. I know some people are anti-shorts, with the way they can frame (read: suction) the top, meatier parts of our thighs. 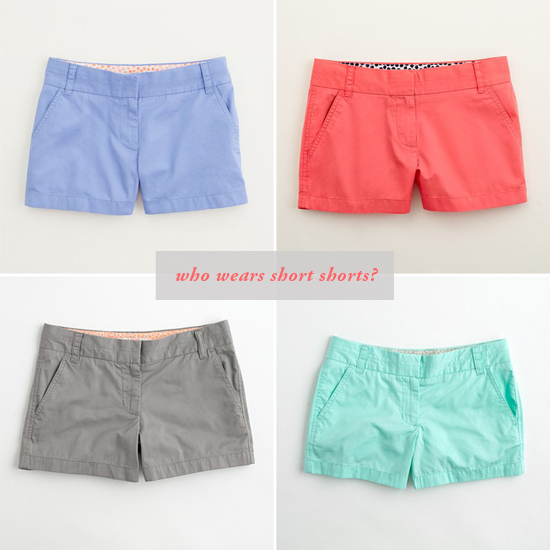 Tell me, are you a shorts girl when warmer weather strikes? Or do you prefer capris and dresses? If you are a shorts girl, do you plan on sporting the ongoing trend of bright-colored bottoms? Which color would you get? And, I have to share because I am so excited about this new concept Danielle and I thought up. We know so many of our Everygirl readers have great taste and regularly shop on a budget, so we want YOU to be the editors for our upcoming feature and submit your top pick for spring flats under $100. If your selection is chosen, your name and link will be included in the feature on Tuesday. Read more about how to submit your fashion pick here! The J-Crew 3 inch chinos are my favorite! I make sure to pick up at least one pair a year so I have quite the selection now. They are the perfect short in my opinion. Thanks for the heads up on the deal! I will have to go ahead and get this years. I am thinking the casablanca blue or ornament orange! I used to be anit-shorts because of my thighs - years of sports growing up did no good to me - but i found if you buy them a size larger than normal they seem to fit just fine, and i like 'em slung a little lower on the waist, too. By the way, I love the Everygirl!! You guys are doing a great job! I am a short shorts girl and dresses in the summer. Some capris don't work on my body type. Athletic legs requires jeans, short shorts, or dresses (not too long tho). Ha-Ha. Colorful shorts and print dresses will be my wardrobe in this hot,summer Houston weather that is about to be here! I do what Molly does and size up and wear them lower on my waist. I love them, but my body isn't quite ready for them yet! Danger danger is what I call the Jcrew outlet around the corner from my office that I frequent during my lunch hour. Totally snagging some shorts in a bit thanks to your sale newsflash. Thanks!!! I'm 5'10. I'm not a fan of cropped pants unless I'm wearing them to work with heels. Wearing them with flats on the wknds makes me feel like I'm waiting for a flood. I def reach for shorts in the warmer months after 5. I LOOOOVE the way that shorts look on other people, but 98% of the time, I lack the confidence to wear them, and if I DO, I am stressing about it all the live long day. I'm making it a point to try to kick that habit this summer because I think they are one of the most effortless ways to look pretty, chic and casual in the summer heat. My body was not made for short shorts... so it's just capris and dresses for me. But I can really appreciate any woman who rocks her long stems with some cute little short shorts! Me i love them ! But thanks to the children i look after they help keep me toned enough to pull them off ! I love being alerted to sales...made my Friday! I'm not really a big fan of shorts (or at least the way I look in them), but living in Texas, some sacrifices must be made. I'd love a closet full of summer dresses, but shorts are a lot cheaper option. Oooh! I love the dressy Carson short & with some bright colored heels that will look amazing. I was going to try out the 4 inch jcrew shorts this year hoping the extra inch would be more forgiving. I will have take the other gal's advice and try a size up. Adorable - Now I need to get my legs into short short shape! Oooo, I cannot wait for summer thanks to your great pics of the shorts! I've never been a shorts girl..I live in dresses. But the Carson shorts might convince me otherwise! I love J. Crew's shorts. I found a navy blue pair at one of the village discounts in chicago in the little boys section and they were less than $1! I would never wear capris...too hot and unflattering.